Apple already offers pretty good RSS readers with Safari and Mail. A dedicated RSS applications can be useful and most of the time offers more features however. One that I particularly like is NetNewsWire. It really looks like a Mac application and it has that shiny iTunes look. It previously wasn't free but it is now a freeware. It has a great integration with applications such as Address Book, iCal, iPhoto and even Growl. When you find an article interesting, it will also let you load the web page directly in the application. It even supports tabbed browsing. 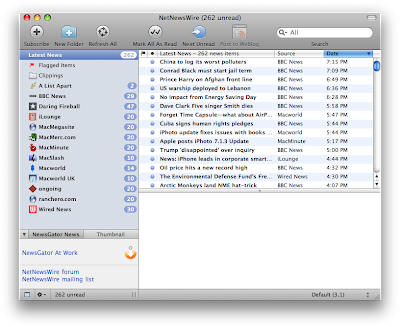 You can learn more or download NetNewsWire here from MacUpdate. Having the Finder automatically hide and show the Dock is really too much of a slowdown for me. Depending in which applications I am working in, however, I sometimes want to have it temporarily hidden. It is easy to do so with a quick keyboard shortcut. The shortcut "Option - Command - D" will turn hiding on and off. 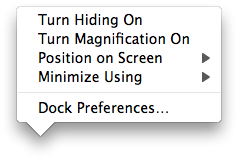 The same can also be achieved by right-clicking on the Dock, between the applications icons and the stacks, and choosing "Turn Hiding On". It is much easier than going to System Preferences every time you want to change this. Disabling the downloaded applications warning in 10.5! 1. Download the "Unquarantine script" from http://henrik.nyh.se/2007/10/lift-the-leopard-download-quarantine (Direct link for the download here). 2. Copy the script to /Library/Scripts/Folder Action Scripts/. 3. Go to your account and right-click on the Downloads folder. 5. Select Enable Folder Actions. 7. 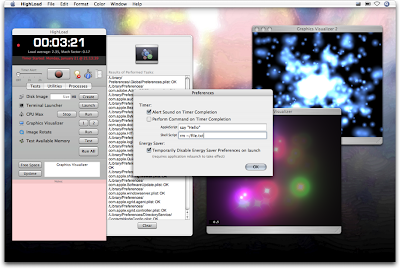 Navigate through the Finder and select the downloaded script "Unquarantine". 8. That's it! You should no longer get the warning from anything downloaded to the Downloads folder. Of course, if you want this to apply to any other folder, you can do it by applying the folder action in the same way. I have to admit that I think Handbrake is really one of the most useful freeware available for the Mac. I think it is even better and more polished than many commercial applications. The presets included with Handbrake are perfect most of the time, but it happens that the source DVD is interlaced. Handbrake thankfully includes a deinterlacing feature, but it does slowdown the process and not all the source DVDs are interlaced. What I started doing was checking out the one frame preview that you get when you click on "Picture Settings..." and I only enabled deinterlacing when there was interlacing issues. It did happened that it was interlaced and it wasn't visible on the preview frame. The solution is that Handbrake lets you check out up to ten frames. You can switch the preview to another frame in the "Picture Settings..." by clicking on "Next" or "Previous". About what speed of deinterlace you choose, that depends on whether you intend to keep the final result for a while. I tried all Fast, Slow and Slowest, but I didn't really see a difference in quality that makes it worth the extra time for me. I usually get between 50-60 frames per second at Fast and around 5-6 frames per second at Slowest (Quad Mac Pro). No Deinterlace is about 10% faster. 1. Right-click (control-click) on the toolbar and choose "Customize Toolbar...". 2. You can simply drag the "Adjust Image" feature to the toolbar. 3. That's it! You can now select an image, click on "Adjust Image" and use the advanced adjustments that you would normally find in iPhoto. 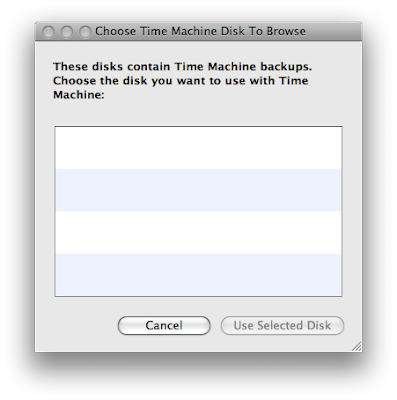 Browsing other Time Machine disks! 1. Click on the Time Machine menu. 2. 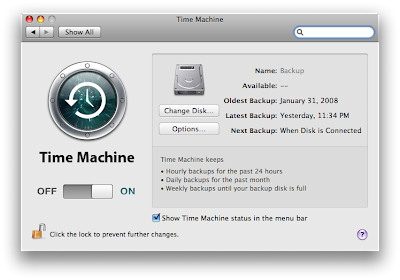 Hold down "Option", the "Enter Time Machine" should switch to "Browse Other Time Machine Disks". Disabling the "Entered Text" warning in Safari 3! 4. Reopen Safari and the change should be done. If you want to revert this and go back to having this warning, you can do it by going through the same steps again but with a "1" at the end of the line you paste in Terminal instead of a "0". The iPod isn't designed to give you access to the files so that it is not possible to just copy them back to your Mac if your hard drive fails or if you just want to have them on another Mac. There are many applications that will let you do that (many were mentioned here and in the comments), but this is not what I want to talk about today. Apple actually gives you a certain level of protection for purchased music. When you right-click on the iPod in iTunes, there is a "Transfer Purchases" option. What this will do is copy over all the music, videos, etc purchased from the iTunes store to your Mac or any Mac (probably PC too) that is authorized for your iTunes account. From my experience, it doesn't look like it creates any duplicate. I know third-party applications might be more flexible, but they are not as easy and elegant. 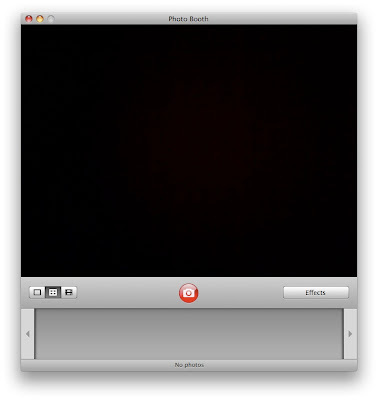 If you are coming from the PC world, you'll be disappointed to see that the Mac version of Microsoft Messenger doesn't support the webcam. There are many alternatives (iChat and particularly Skype) that I think are even better, but unfortunately, if your friends are on MSN, that is where you need to be. There is now one solution for getting webcam support for MSN on the Mac (excluding Boot Camp, Parallel and Fusion). It is aMSN. It really isn't as nice as Adium, but it does the job. In my experience, it isn't as stable as it should be but it is still fully useable. You can learn more or download aMSN here from MacUpdate. 2. 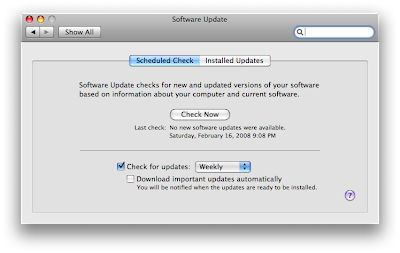 Click on "Software Update". 3. Uncheck the checkbox next to "Download important updates automatically". Creating an animated avatar with Photo Booth! Thanks for the tip Julian! The menu bar transparency is now optional! 2. Click on "Desktop & Screen Saver". 3. Click on the "Desktop" tab. 4. There is a new "Translucent Menu Bar" checkbox. I wanted to get a PDF document made out of a few Word documents. My first idea was to simply copy and paste all the documents to combine them before printing it as a PDF. I guess I am not quite a Word expert, because it really affected formatting. I didn't want to have to redo the formatting so I decided to just deal with multiple PDFs. That was until I found the freeware called Combine PDFs. It is really simple to use. You just drag and drop the documents in the right order and press "Merge PDFs". 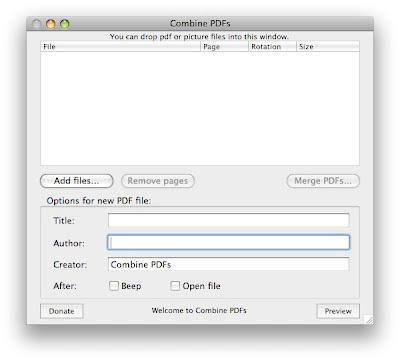 You can learn more or download Combine PDFs here from MacUpdate. Display a folder icon for Stacks! Time Machine in the menu bar or in the Dock! Converting videos for the iPod! 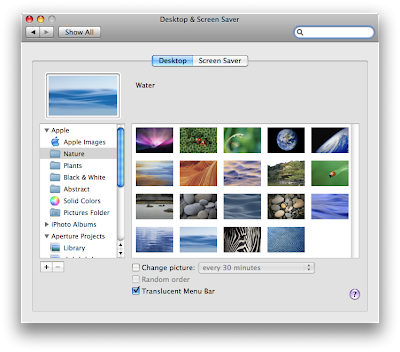 Converting videos for the iPod is something that is relatively easy with applications such as Handbrake. Unfortunately, Handbrake only works with DVDs or video_ts folders. I already used Handbrake for many videos, but I realized I used settings that were too high quality for the iPod. It didn't bother me because I was only watching them on my Mac, but now that I want them on my iPod, it really does. I thought it wasn't a problem because QuickTime Pro has presets for the iPod (and the iPhone). The problem is that QuickTime Pro is not very convenient. It takes an enormous amount of time and there is no queue. I found a part of the solution in a free application called iSquint. What I like about it is that much like Handbrake, you can create a whole queue of encodes that needs to be done. It is also pretty easy to use, you can optimize for iPod or for TV (still compatible with the iPod, but encoded at 640x480 instead). It is also slightly faster than QuickTime Pro (and free!). 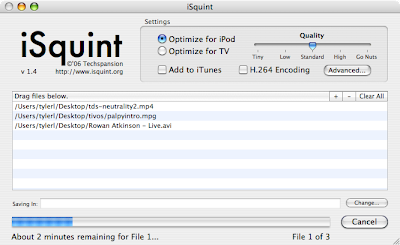 You can get more info or download iSquint here on MacUpdate. Saving as .doc by default instead of .docx! One thing that I found really annoying with the new Word 2008 is that it always wanted to save the files as .docx by default. The problem is that .docx files are not compatible with previous versions of Word and not everyone upgraded to the latest version. With .doc, you are pretty much certain that nearly everyone will be able to read it. 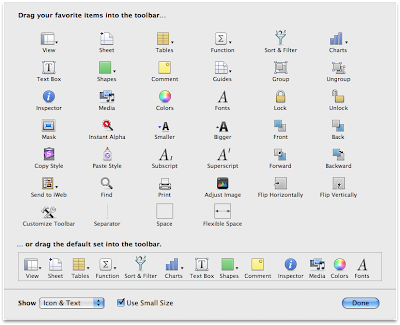 It is possible to change the default behavior in Word's preferences. 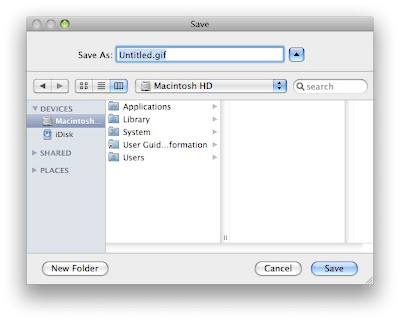 It is located in the preferences, under "Save". 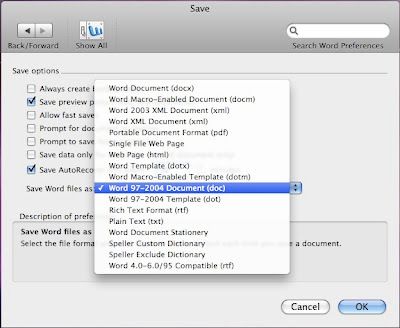 From there, you can select "Word 97-2004 Document (doc)" under "Save Word files as". Searching through your browser history! 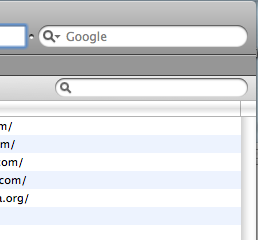 At first, when looking at Safari's history menu, there is no obvious way to search the history. I already mentioned, however, that it is possible to access the history through the bookmarks section (by clicking on the open book at the left of the bookmark bar). 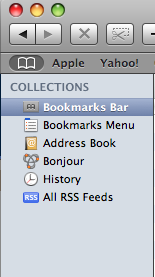 What is great is that this section has a search bar that lets you search through your bookmarks. But, what is even better is that it will also let you search through the history. It is a quick and convenient way of finding a website you already visited. Opening a file from a stack in a specific application! Stacks are not quite like a Finder window, because it is not possible to right-click on a file and choose an application to open it in. There is still a way to force the Finder to open a file from a Stack in a specific application without even loading the stack folder in a Finder window. It works really well when the application you want to open it with is in your Dock. The way it is done is by simply dragging the file from the stack to the app. If the application is not one that is recommended by the Finder, the icon won't become highlighted, but you can still load it in this app by holding down "Option - Command" when dragging the file. New calendar or new calendar group in iCal! I didn't even know it was possible to separate multiple calendars in group before discovering this shortcut. 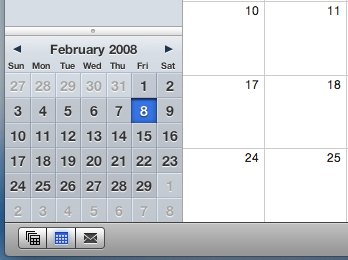 To create a calendar, you simple have to click on the "+" in the lower left corner. What was new to me is that if you hold down Shift, however, the icon will change to let you create a calendar group. 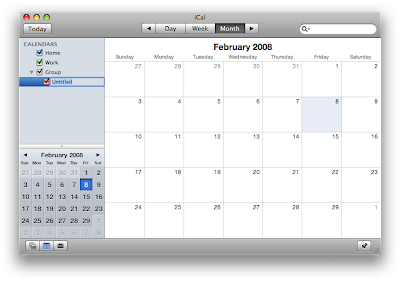 You can then create new calendars within the group, or simply drag existing ones. If you are editing on a laptop or on a less powerful Mac and you know exactly what you want to do, it is possible to disable rendering in Final Cut Pro. The shortcut is Caps Lock. It is very useful when working with complicated animations. 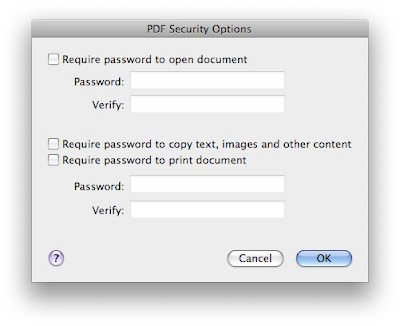 Security options when printing to PDF! 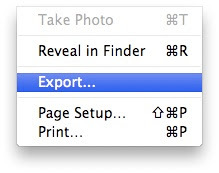 The print to PDF feature of Mac OS X is one that I use a lot. I think it is so much more lightweight and useful then using the Acrobat. It is improved a lot in Leopard. It now includes security options. When you go to "Print" and choose "Print as PDF", there is a new button "Security Options...". What it lets you add is password protection. You can choose a password to open the document, a password to copy text from the document or a password to print. Sorry about the late tip. There is a storm where I live and my high-speed internet just went down. I am posting this on dial-up (I think I only realize how slow it is when I am stuck using it). 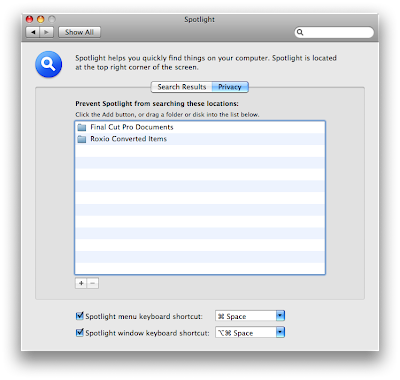 Adjusting Spotlight for your Time Machine backup! 4. Click on the "+". 5. Navigate to your backup disk and find the folder called "Backups.backupdb". 7. That's it. The backup should now be excluded from Spotlight searches. Syslogd maxing your processor at 100%! 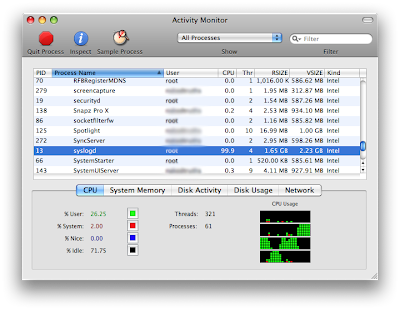 There is a bug in Leopard that randomly affects the performance of your system. I was fine for a few months, but it started this week on my MacBook. I researched a fix for the problem and apparently it only happens if you have .Mac. It is a problem with the new Back to my Mac. What it does is it maxes one core. It is hard to notice on a quad or octo Mac Pro, but on a two cores Mac, it really affects performance. I don't really have the perfect solution. The only way I found of getting the performance back is to deactivate Back to my Mac. It is not much of a loss, because it never really worked anyway. I still hope it will be fixed in 10.5.2, but in the meantime, it is nice to know how to avoid losing processor performance. After deactivating Back to my Mac, you'll need to restart your computer or force quit syslogd. Getting rid of duplicate songs in iTunes! There is a really cool feature in iTunes that let you quickly check for duplicates and get rid of them. I sometimes copy music to my laptop from my desktop, erase it and copy it again. It happens especially often because my laptop hard drive is not always big enough. The thing is, I don't take the time to check each song one by one. After a while, you end up with duplicates that take even more space on your hard drive. 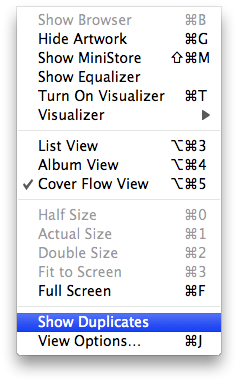 To have iTunes display a list of all duplicates, simply go to the View menu and choose "Show Duplicates". You can then choose what to do with them. Pushing your Mac to the max! HighLoad is a great application for detecting something wrong with your computer. It is actually being used by the Genius in the Apple Stores to find issues. It is especially good with intermittent problems. The application is not designed to give you the info about what went wrong however, but it can prove you that everything is going fine or you can check the logs to find precisely what's the problem. 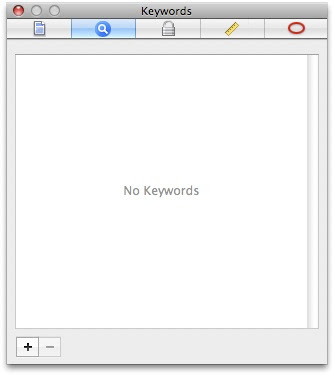 The application also lets you rebuild the Spotlight index and clear the system cache. You can learn more or download HighLoad here from MacUpdate. 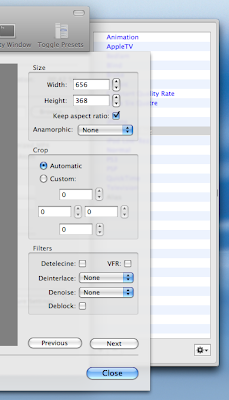 Fine-tuning the adjustments in Pixelmator! With this great opportunity to get Pixelmator at an awesome price, I thought I'd post a Pixelmator tip today. 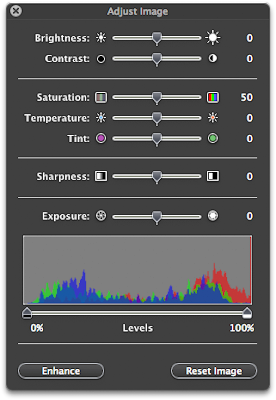 When you make adjustments to an image in Pixelmator, let's say Hue/Saturation, you can make the rough adjustments by moving the slider with the mouse, but what if you want something more precise. It is possible to really do some fine-tuning by clicking on the image that is on either side of the slider. It moves the slider at just the right speed to achieve the perfect settings that you are looking for. I rarely post about stuff on sale, but I think this one is really worth it. Even though I use Photoshop daily, I often use Pixelmator since I have it because it is so much faster at what it does. I think it is useful for pros and especially the best choice if you don't need all the power of Photoshop. I bought it at full price ($59) because I think it is worth it, but now it is a real bargain at $29.99 from MuPromo. It is only a one day sale, so if you are interested, check it out here. The Mail app and Gmail! 1. 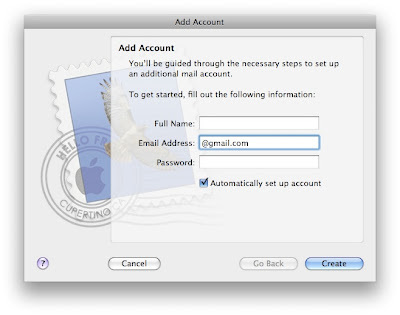 Add your account to Mail while making sure you uncheck "Automatically set up account". 2. Choose IMAP and follow these instructions provided by Google to set it up as IMAP.